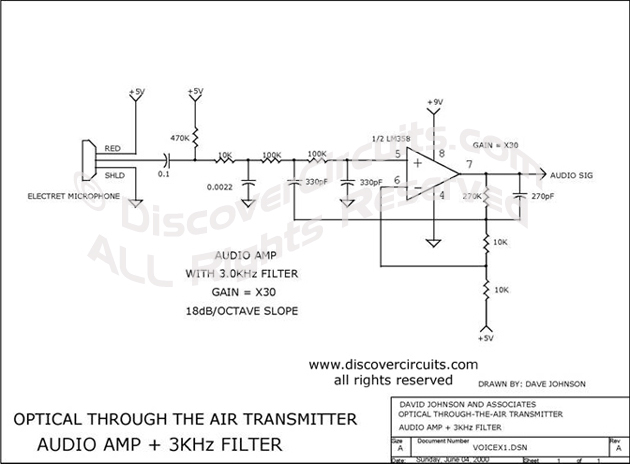 Circuit: AUDIO AMP + 3KHz FILTER__ Circuit designed by David A. Johnson, P.E. This circuit is the audio Amp section for a complete optical transmitter. The circuit Amplifies and filters the voice audio signals from an electret microphone. The circuit is described in more detail in the receiver section of Dave Johnson's Handbook of Optical Through the Air Communications.